For over a decade, thousands of folks have rallied in Northwest Arkansas for one of the best motorcycle events in the country. Bikes, Blues & BBQ has some amazing events but the real attraction is actually the journey. See an entire BBBBQ Schedule Here and Read the Official Blog “Road to the Rally” Here! Centered in the Ozark Mountains, winding roads and breathtaking scenery make the road to the rally spectacular. Of course, next to the Pig Trail, the roads leading to Eureka Springs are some of the best for riding. Eureka Springs is located near many area attractions and is a great hub for multiple routes. See great motorcycle rides in Northwest Arkansas. Feel free to stay awhile and explore. Eureka Springs is motorcycle friendly. Check out Pig Trail Harley in Eureka Springs. Discover area attractions, Eureka Springs Lodging, Dining and other resources. Make plans for your group to stay together with these amazing rates just for you! 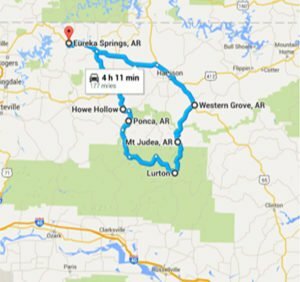 #1 The most adventurous and most scenic rides in the Ozarks are all accessible from Eureka Springs. 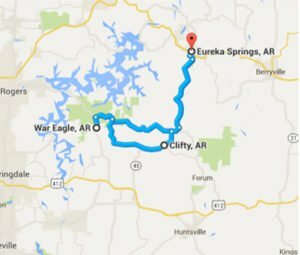 Ribbons of road curl around the Ozarks to reveal the most amazing views. From grazing elk in the historic Boxley valley near America’s First National River to the famous Pig Trail, Eureka Springs is centrally located to access the best motorcycle rides in the state. Eureka Springs’ landmark hotels have been welcoming visitors to the area for centuries. They wouldn’t be able to keep their historic reputations if they didn’t know how to take care of their guests. The 1886 Crescent Hotel and the 1905 Basin Park Hotel both offer designated bike parking to secure your most prized possession while you relax for the night. Special pricing for groups of 5 people or more make staying overnight a great value so you can use the money you saved to fill up and hit the road for your next adventure. Enjoy drinks over a game or two of pool in Lucky 7 billiards at one of the highest points in downtown Eureka Springs. Make the veranda of the Crescent hotel your private hang out by staying in the connecting rooms or choose balcony rooms that look out over the Crescent East Lawn. Rock it out old school in rocking chairs on the porch overlooking the town. Gather around the fire in the pocket garden near the Crescent moon. Hang out at the copper bar of the Balcony Restaurant overlooking Basin Spring Park downtown. There are so many options. Give us a call and we will assist you in arranging a memorable trip. Eureka Springs is home to castles, the blues, bears and other big cats, crazy festivals and craft shows, fabulous parades, rivers, lakes and natural springs … The list goes on and on. Learn more about Eureka Springs and get ideas for things to do. Spring and Fall are the best times to visit just for the colors of the season but Eureka Springs is open year round. There are different things to look forward to depending on the time of year. Talk with us about what time of year you plan to visit. Spring Break in Eureka Springs always promises something funky and fun.Get Out and Ride! Wear something green and don’t miss the Annual St. Patrick’s Day Parade in the heart of historic Eureka Springs. Get Biker’s Best Rates on lodging. Fly a kite at the Eureka Springs Kite Festival. The kite festival is held at Turpentine Creek Wildlife Refuge so while you are there, stop in and see Bam Bam the bear. Get tickets! Hunt ghosts in Americas Most Haunted Hotel. Featured on top cable shows like “My Ghost Story” and “Ghost Hunters”, the ghosts are pretty well documented but you can experience the spirits for yourself. Tours are offered each evening. Get tickets! Take a ride along the Arkansas Art Trail and visit some of the most beautiful and inspiring sites in Arkansas. Eureka Springs is a Winter Destination Too! Eureka Springs is the perfect getaway for couples. Treat your and your partner to a hot stone massage in one of Eureka Springs Spas. Enjoy amazing Eureka Springs food and discover you new favorite hangout where you can meet up with others just like you. Eureka Springs is renowned for its music festivals like Blues Weekend, Bluegrass Weekend, Ozark Folk Fest and the newest festival Ozark Mountain Music Festival but you don’t have to wait for a festival to enjoy the town. Get the inside track on things to do in Eureka Springs during the winter. Eureka Springs is just getting warmed up. See Biker’s Best Lodging Deals! 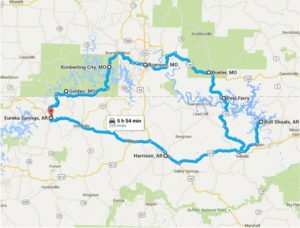 The Ozarks are of the best areas to ride motorcycles in the nation. Check out these websites for more great motorcycle rides in the area. Serving breakfast, lunch and dinner, Angler’s Grill is known for the best catfish around. Grab a snack while you are on Riders Trail #3. Located on Highway 62 in Eureka Springs West, Angler’s has a relaxed atmosphere and outdoor deck. All over the “lower 48”, men and woman who love their motorcycles are marking days off of their calendars as they count down to when they will pull on their leathers, fire up their bikes and start their adventurous ride to the Arkansas Ozarks and one of “America’s Distinctive Destinations”, Eureka Springs. The reasons are two-fold and it all centers on “pork” …The Pig Trail and Bikes Blues & BBQ. The Pig Trail is a not-so-straight ribbon of asphalt; in fact, the ribbon that looks like someone has scraped it across the edge of a scissor blade. It stretches, for all practical and awesome purposes, from Interstate 40 near Ozark (AR) north along State Highway 23 to Eureka Springs, the gateway to northwest Arkansas. This 80-mile route is universally praised in motorcycle magazines, on biker websites, and even by The Discovery Channel for being one of the best in America.  For example, MotorycleRoads.com has elevated the Pig Trail to the number eight position in their most recent “top 100” poll. BikerBudz.com gives it a “highly recommend” while Motorcycle-USA.com refers to it as “my new favorite ride”. The Discovery Channel has given the Pig Trail its highest mark yet: number two in the nation. 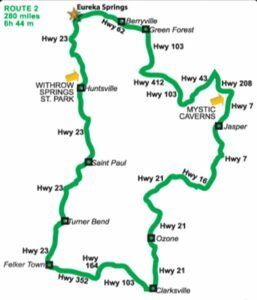 The official National Scenic Byways’ 19-mile portion of the Pig Trail starts as you enter the Ozark National Forest from the south and ends near Brashears (AR) as you exit the national forest to the north. 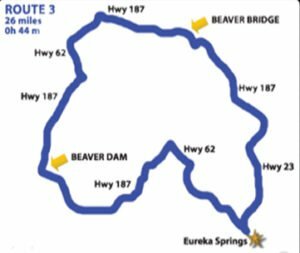 This route, which crosses both the Mulberry and the White rivers, has so many S-curves that motorcyclists are forced to make dozens of ultra-quick right-to-left-to-right and back again leans; perfect first-gear switchbacks. But riders should not think the challenge of the ride is limited to “the forest”. It starts once you exit Interstate 40 heading north and doesn’t end until you put down your kickstand for the night in Eureka Springs. Find new, thrilling nearby motorcycle rides in the Ozarks. If you are unable to attend the “triple-B event” do not despair, because “does Mother Nature have a deal for you” in October and often through early November! There is no more lovely autumn color than the reds, oranges, golds and violets of the Ozarks when fall falls. To help you with perfect timing, the State of Arkansas, beginning in September each year, has a “fall color updates” page on their very popular Arkansas.com website. And speaking of the State of Arkansas, their Department of Parks & Tourism has developed a short movie that will whet your appetite and make you hungry for a motorcycle vacation to “The Natural State”. It just so happens that a local motorcycle enthusiast who is also the Mayor of Eureka Springs, Morris Pate, narrates the movie. His narration begins with him and his 2001 Harley-Davidson Electra Glide Classic parked in front of the “Little Golden Gate Bridge” just a few minutes west from downtown Eureka. Make Eureka Springs your hub for Ozark rides. Check out Eureka Springs Lodging and great deals for two wheels. Photo by Edward C. Robison III. With attention to the Northwest Arkansas region on a high mark with the opening of the Crystal Bridges Museum of American Art and the Sesquicentennial Celebration of the Civil War, tourism leaders in the region have come together in the development of The Arkansas Art Trail. “A large group of new visitors to the area will be drawn to Bentonville for the opening of the museum; however these same touring vacationers will also want to know what else is available in the region. The Arkansas Art Trail will provide those answers” stated Rachael Moyer, CEO of Historica Consulting and the driving interest behind the concept. “The Arkansas Art Trail is a project to map sites in the Natural State where nature inspires art.” Modeled much in part to the Thomas Cole Art Trail in the Hudson Valley, Arkansasarttail.com will feature Breathtaking vistas, mountain views, nationally significant sites, and natural settings are complimented by architectural features and made meaningful by local heritage and cultural sites. 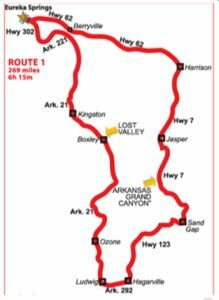 Arkansasarttrail.com includes ten stops that include such well known destinations as Crystal Bridges Museum of American Art or Downtown Eureka Springs but also guides you lesser known but nationally significant points of interest such as Boxley Valley or Inspiration Point. The website provides resources to guide you on your actual or virtual journey along the Trail encouraging touring vacationers to wear comfortable shoes open your eyes and prepare to be inspired. Realistically, viewing the Arkansas Art Trail in its entirety can take 3-7 days depending upon how long you choose to linger at each site or how many side trips you take. The trail has been organized into 3 legs that take an average of one day to complete. Side trips have been noted that include additional features you may find inspiring. Samples of each leg are provided on the website with breathtaking photography provided by Edward Robison III. Throughout the year, events relating to the Trail including guest speakers, gallery strolls, open studio tours and guided walks are held and will be promoted by arkansasarttrail.com with active blogs and social media as a vital component of the effort. “Overnight on the trail” at one of Eureka Springs Lodging and get great deals for two wheels.